There’s no “right” way to organize your folders and devices, but here are a few tips that I’ve applied over the years to keep things organized. Group items into folders. As you add devices to your network, they start to get harder to quickly locate. So just like files on your file system, you should organize devices into folders. The key thing to doing this is to have the right “breadth” and “depth”. That is, you want to have enough folders to break up the devices into logical groups (breadth), but not TOO many folders that would mean you have to click through many levels to get to devices (depth). For example, at my place I didn’t have that many devices so I just created a separate folder for each room. But in a larger installation, I might have created a separate top-level folder for each floor, and then another level of folders for each room. This makes it easier to find devices through an application like MobiLinc, but there’s another benefit in the ISY interface. When you click a folder in the ISY application, you only see items in that folder on the right side. So, click “Network” link at the top level and you’ll see all devices. 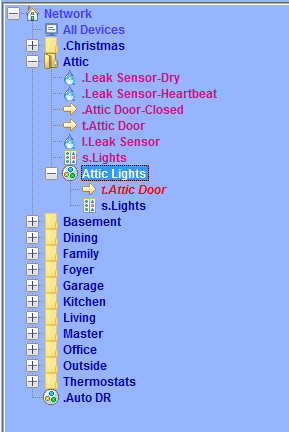 If you have a level of folders called “basement”, “first floor”, etc., clicking on those folders would only show devices on that floor – and then clicking a room name filters the devices to just that room. Give descriptive names of the devices. This one is fairly obvious, but “descriptive names” may mean something different to different people. For example, because you’re grouping your devices by room, you may want to label the main lights in that room as “Main” because the folder specifies the room name. On the other hand, if you’re viewing all your devices in one flat view, you may not want to have a bunch of devices simply called “Main”. In my case above, I used “Attic Lights” for the name of the main scene up there, but in other cases I called the main lights just “Main”. Be consistent with naming. Sure, I just said the exact opposite thing in the previous point – I’m not always consistent in my naming – but trust me, if you’re building from scratch it’s good to put some time into planning and being consistent with your names. “Main” vs. “Attic Lights” is one type of inconsistent naming convention, but you may find yourself using others. For example, if you have multiple outlets in various rooms, decide what convention you’re going to use – “North” and “South” or “Front” and “Back”. And if you do use something relative like “front” and “back”, be consistent in its meaning – should “front” mean the outlet closest to the front of the house, or closest to the main entrance (front) of the room? Use a naming prefix to identify device type. I generally interact with my system through scenes rather than devices, so I tend to name my devices a little differently. Specifically, I use a letter prefix to indicate the TYPE of device. In the example above, I used “s.” for “switch”, “t.” for “triggerlinc”, “l.” and for “leak sensor”. This comes in handy when I’ve got multiple devices or sub-devices with the same name. For example, I use “m.Front Door Lock” for my MorningLinc device, and “t.Front Door Lock” for my TriggerLinc to monitor the lock status. Another possiblity is using a prefix for “sub-devices” – for example, if you add an ioLinc you could use “i.Garage Door” for input (sensing) and “o.Garage Door” for output (control). Hide devices from MobiLinc. We’ve talked about this one before, so check out this post. 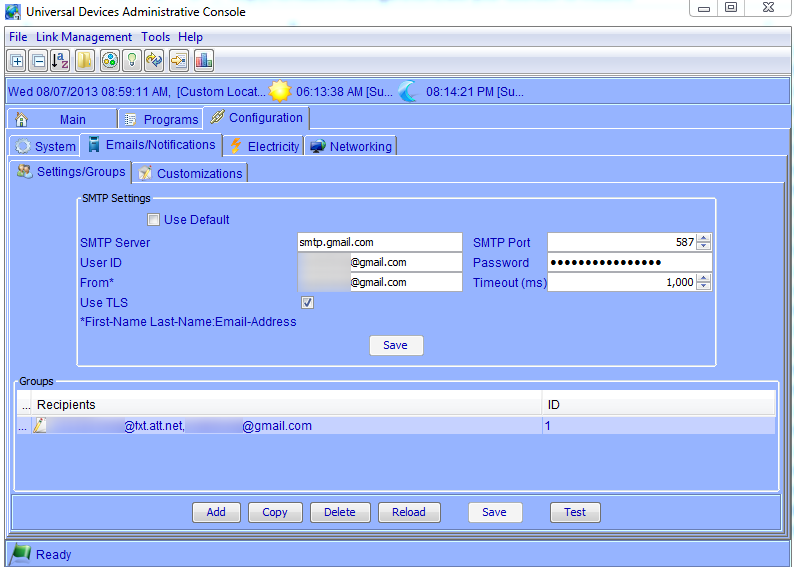 The idea is that in MobiLinc you can hide extraneous devices, scenes, and programs that start with a specific character (I use a period character). Plus, it helps to alphabetically get these items clustered together in the ISY interface to help find the one you’re looking for. For example, in my attic example above, the TriggerLinc for the door has a device for “open” and a “sub-device” for “closed”. There’s no real reason why you’d need to see both of these in MobiLinc, so I hide one with the name “.Attic Door-Closed”, and label the one I’m looking for as “t.Attic Door”.